Word on the street is that a Sunday well spent brings a week of content. Naturally, that means it's essential to participate in New Yorkers' favorite lazy day activitity: brunch. Eggs benedict, chocolate chip pancakes, strawberry French toast—is there anything more heavenly than a late-morning bite? 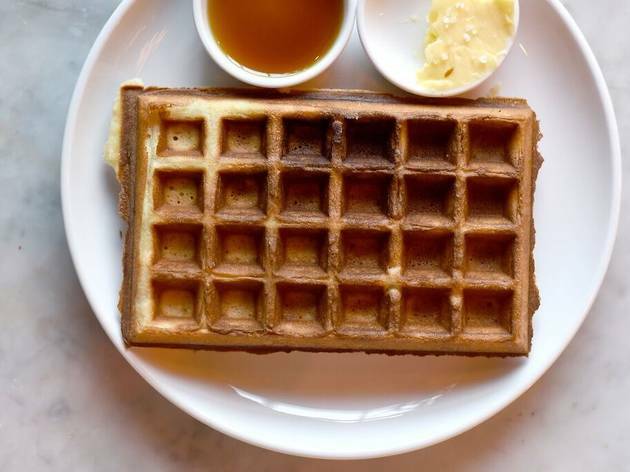 Although there are longstanding favorites within the five boroughs, these new brunch spots for families that have opened within the past year or so have really made a splash and totally deserve a visit. Grab a mimosa (and some juice for your tots) and enjoy that omelette! Looking to make the most out of your Sunday with the fam? 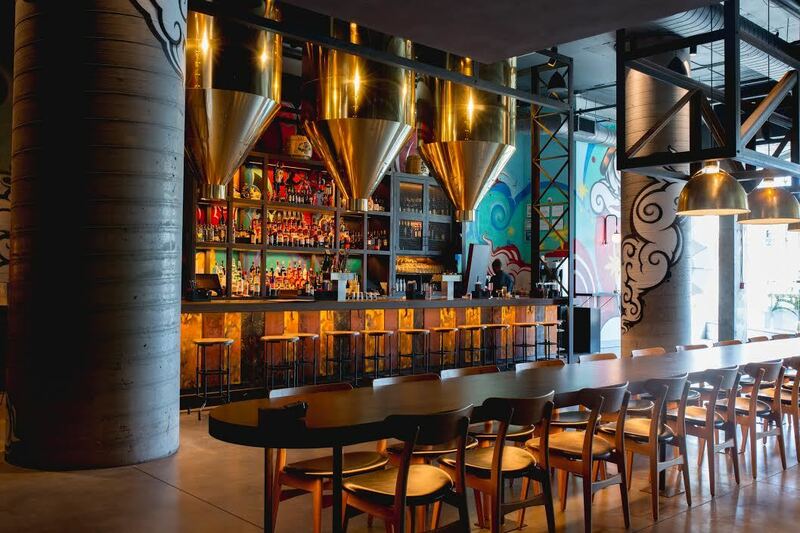 Grab a bite at one of these fun restaurants, browse even more of our favorite spots for brunch in NYC, wander around one of NYC's museums for kids or grab tickets to one of the many new kids movies. Cereal is a neccessity to starting your day, and this Kellogg's brick and motar store allows you to add a little pizzazz to your bowl of morning goodness. Marshmallows? Check. Dried fruit? You bet. Nuts? Of course. You can mix and match till your heart's delight, sip on specialty cereal drinks and of course, document your adventurous morning at the Instagram station. 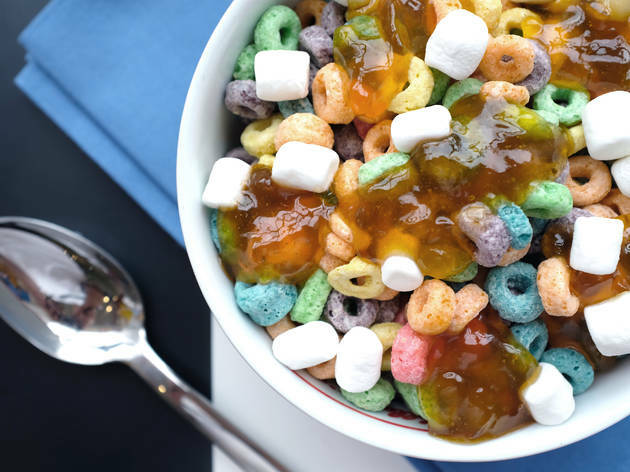 Sweets and Instagram likes totally make Kellogg's one of our new brunch spots for families. 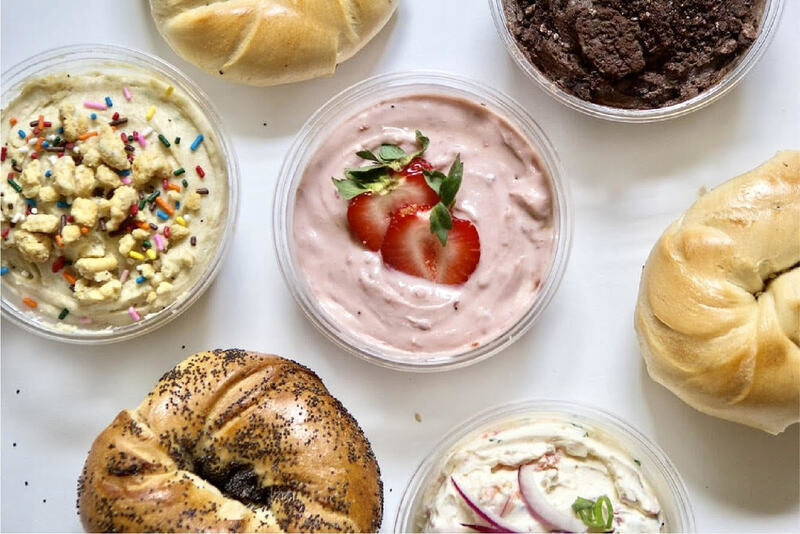 Becky's Bites is the perfect way to celebrate New Yorkers' favorite breakfast food: bagels. 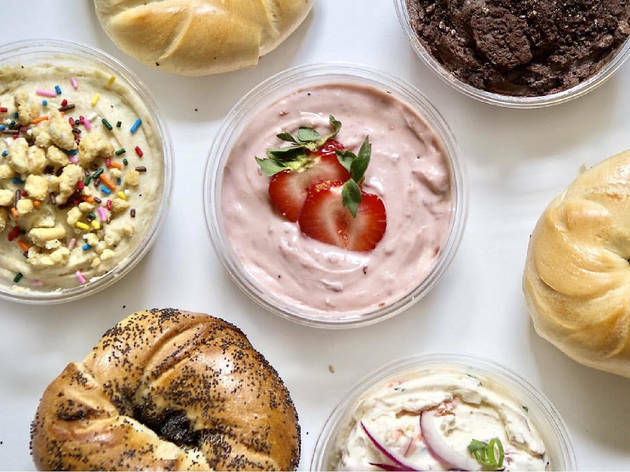 The cream-cheese only specialty shop—which includes basic cream cheese and offerings such as cappuccino, peanut butter and cookies and cream for the adventurous—makes for a wonderful start for the weekend. With adorable plates such as "Beckaroos" (Teddy Grahams in funfetti dip), your little kids will love making a pitstop at this NYC venue. Sunday in Brooklyn arrived in late 2016 and quickly rose to brunch superstardom. 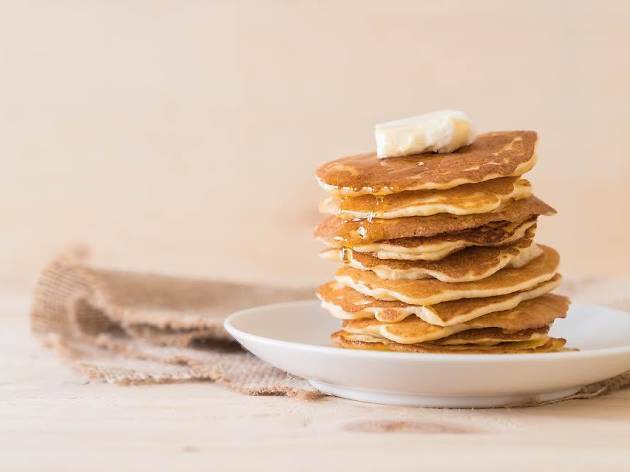 Offerings such as chocolate chip pastries and malted pancakes with hazelnut maple praline and brown butter will keep little ones on a sugar high while the adults in the group will love the cheddar scrambled eggs with a side of Long Island home fries or the Avocado toast with whipped ricotta, wheatgrass and toasted seeds (because avocados will always be in season). Looking for a new go-to? 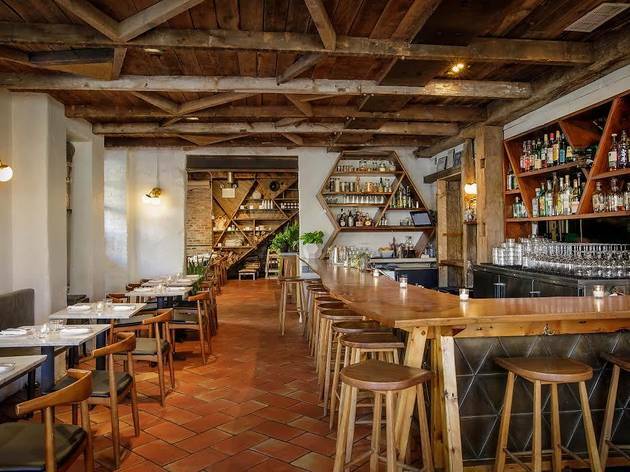 This is one of the best new brunch spots for families, so get ready to indulge this weekend. This glorified coffee shop was a welcomed addition to its Carroll Gardens neighborhood in 2017. East One's cozy, laid-back vibe is great for those who want to to induldge in some sweet pastries and egg sandwiches before strolling through mom and pop shops on Court Street. Those feeling a bit hungrier can opt for dishes such as grilled arctic char while your tots munch on a mac and cheese casserole. Photograph: Courtesy Danielle Adams for BeccaPR. Part of the Jane Hotel, this new brunch spot for families offers staples like blueberries with granola and yogurt and the classic American breakfast of scrambled eggs, bacon and potatoes. 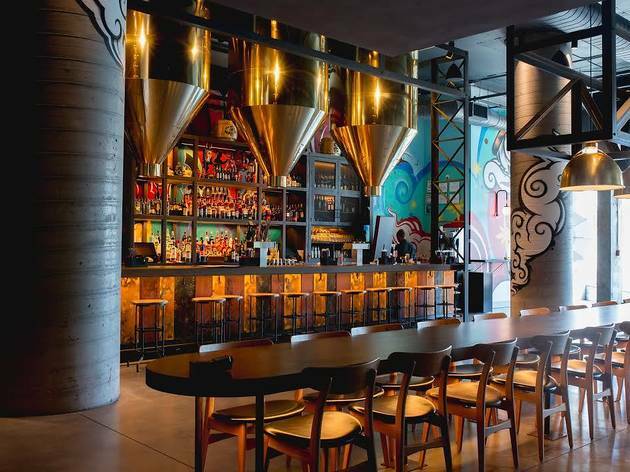 However, for those who are indecisive and can't quite settle on breakfast or lunch have the option to enjoy a fried egg sandwich or go all-out with a bowl of pasta or margharita pizza. Your Sunday brunch gets an added flair thanks to offerings such as pho soup dumplings and mapo dumplings. 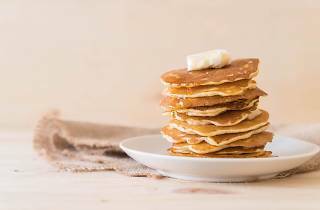 However, you can still find the classics like silver dollar pancakes and fun takes on favorites (your kiddos will go crazy for the PB&J sesame balls). 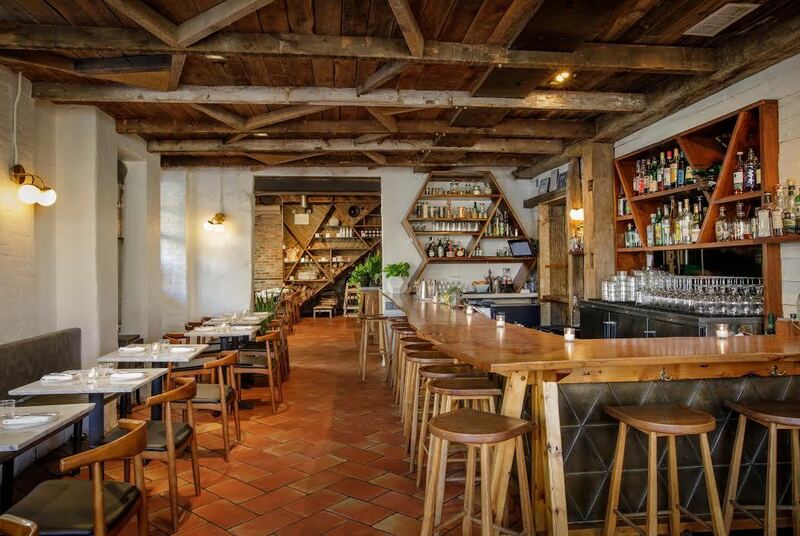 This is one of new brunch spots for families that offers the familiar...but with a twist. A breakfast pizza? No need to tell us twice—we're sold. 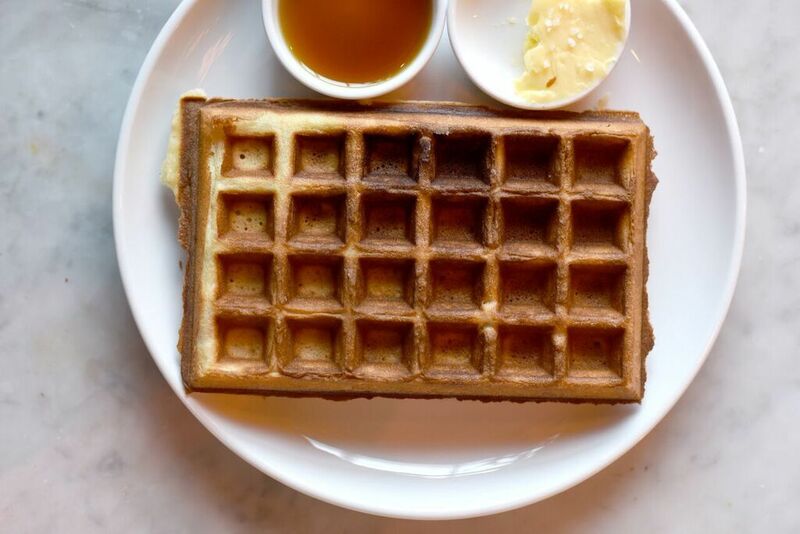 Massoni, a restaurant that opened in late 2016, lets families enjoy waffles, breakfast croissants and scrambled eggs all while adding an Italian flair with dishes such as fig jam with ricotta and prosciutto. If you're really feeling adventurous early in the day, don't be afraid to indulge in a meatball parm or pasta carbonara—the offers are on the table. 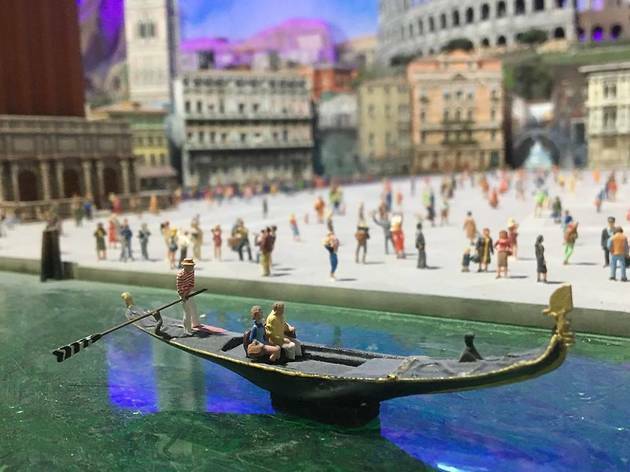 Even the smallest kids will feel like giants in this astounding world of miniatures. The Times Square attraction is in a league all its own with 50,000 square feet containing approximately 300 models, 1,000 trains with 12,000 wagons, over 10,000 cars and 50 airplanes. Replicas of well-known locales around the world—along with some fantastical ones found in our favorite books—cover this massive installation and with little vehicles coming and going every which way, it’s a place a child could get lost in for hours. If the family wants to be a deeper part of the action, a 3-D scanner will turn you all into model citizens for a fee. All ages. 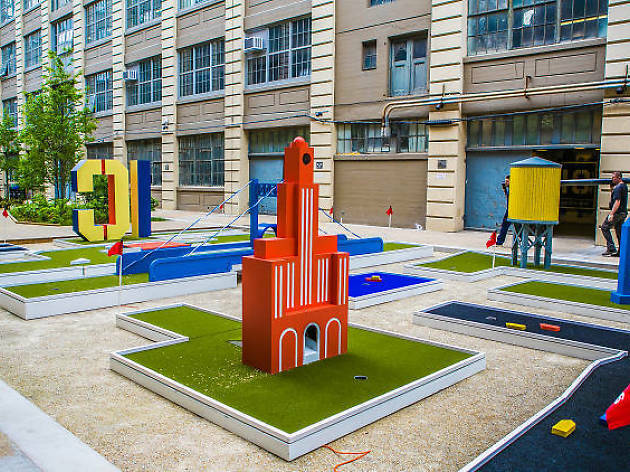 If you’re looking for an easy breezy afternoon outing, Industry City has a new mini golf course that’s all about Brooklyn. 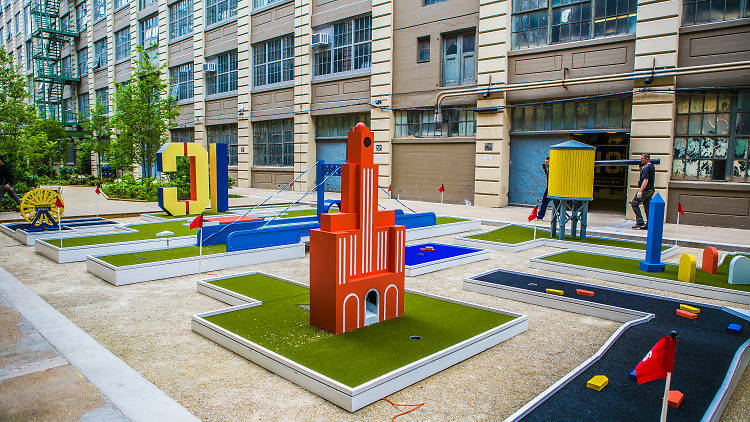 Located in the courtyard behind the Wheelhouse, the course features colorful local icons such as the Williamsburg Savings Bank Tower, Coney Island’s Wonder Wheel, the Brooklyn Battery Tunnel and the Brooklyn-Queens Expressway. There’s even a kid-sized water tower and blue-colored "green" to represent the Gowanus Canal. Courtyard 5–6 (718-965-6450, icsummerspree.com). Mon–Thu 11:30am–8pm; Fri–Sat noon–9 pm, Sun noon–6pm. $10, children $5. 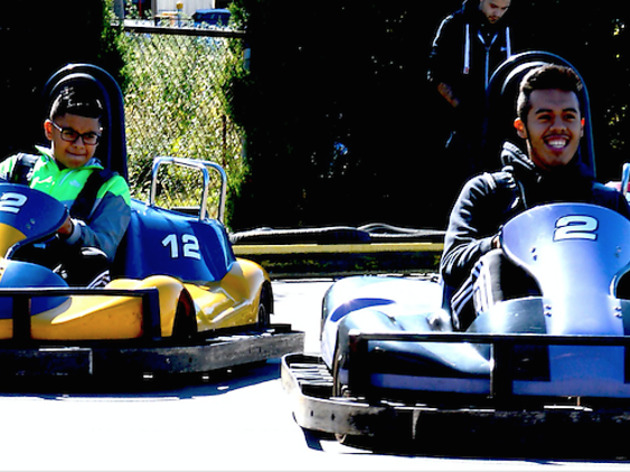 Staten Island Go Karts got a sweet makeover earlier this year and reopened as Staten Island FunPark. 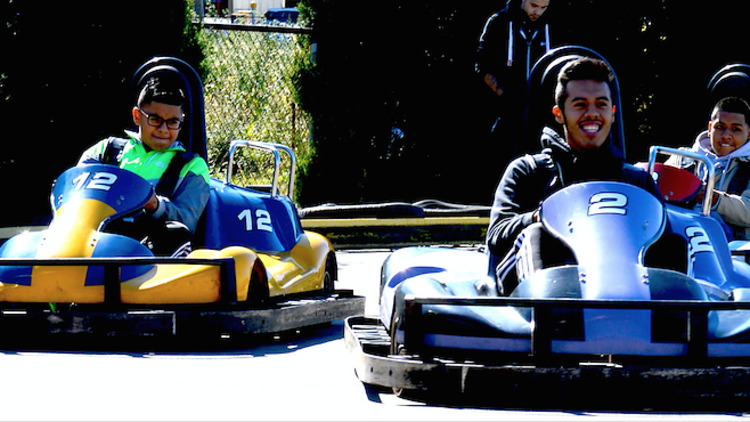 Head over for its 800-foot GoKart course, nine outdoor batting cages, an 18-hole mini golf course, games and snack bar. All ages. 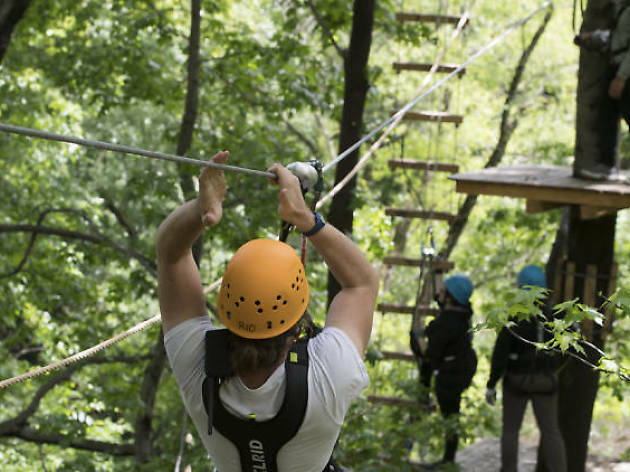 Thrill-seekers can roam above the trees or zip line over the Bronx River at the Bronx Zoo’s new Treetop Adventure course. 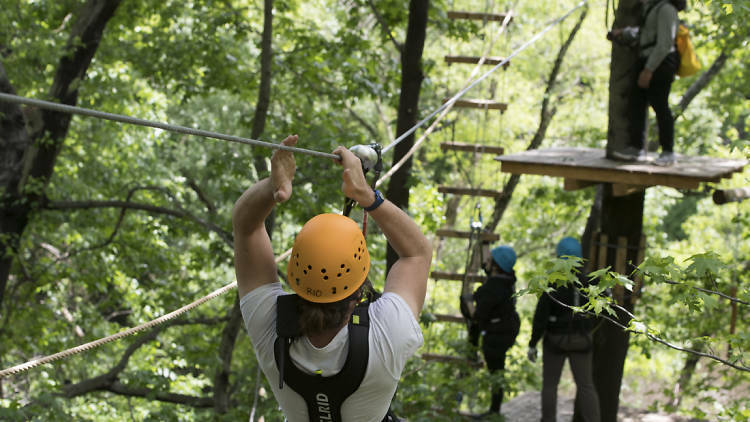 The park features seven aerial courses and eight to 12 different challenges of rope bridges, tight ropes, ladders and swings above the forest canopy. The courageous can then hop on one of two zip lines to travel 800 feet over the river and back while 50 feet above the ground. Participants must be at least seven years old, weigh between 50 and 275 pounds and able to reach 5’6” with their feet flat on the ground. Explore life under the sea in this 60,000-square-foot virtual realityscape. The immersive experience invites all ages to interact with sea lions, rays, dolphins, humpback whales, sharks and squids without getting your clothes wet. Photo-real animation, giant project screens and interactive technology will make kids feel like they’re truly playing with the fishes. An exact opening date is yet to be set for this coming October, but tickets are already on sale so be sure to grab a time slot to get in on the underwater action. 226 44th St (natgeoencounter.com). $39.50, seniors $36.50, children 12 and under $32.50.